Type: Memorial stone with bronze figure of Victory triumphing over Evil. 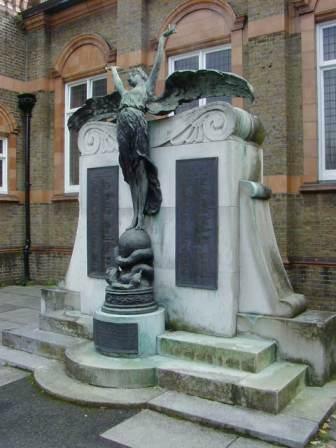 Description: Three steps lead up to a memorial stone with a bronze figure of Victory triumphing over Evil in the centre. There are bronze plaques in the centre and on either side listing the names of those who died in WW1 with a new inscription added of those who died in WW2. There is also a plaque at the back listing the partners and employees who took part in WW1. those who laid down their lives.